If no date is listed, that means that we do not know when the next clinic will happen. Clinics are generally held in October and mid-season and are limited by volunteer instructor availability. A good way to ensure that you can attend a clinic is to volunteer to organize one! Clinics are announced via the CBC members mailing list , our Twitter feed, and are posted on the CBC web site. You can participate in our winter events with a pellet rifle on the 10 meter range if you haven't attended a Red Book (safety certification) clinic. NOTE: You can NOT use a .22 rifle in a race if you have not been safety certified! 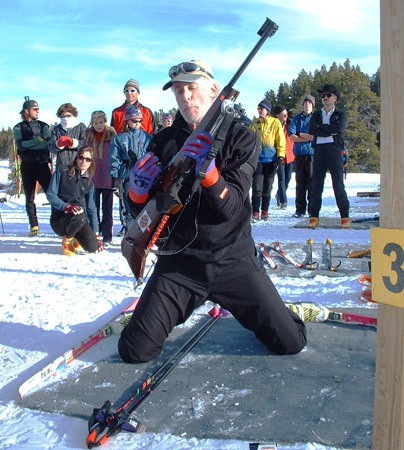 Air rifles and the associated targets are available at the Snow Mountain Ranch race venue for individuals who have not yet attended a safety clinic. If you have previously participated in a summer biathlon event, please note that the summer race briefings do not satisfy the safety certification clinic attendance requirement for winter race participation. Clinic attendees must be at least 12 years of age. Competitors must be 13 as of December 31 of the winter competition year (e.g., age 13 by December 31, 2014 for the 2014-2015 winter season) in order to race using a .22 rifle. All range users under the age of 16 ("under-aged person") must have a parent or assigned responsible adult (at least 18 years old) closely supervise their .22 caliber or pellet shooting activities on a one-on-one basis for practice, certification, training and races. 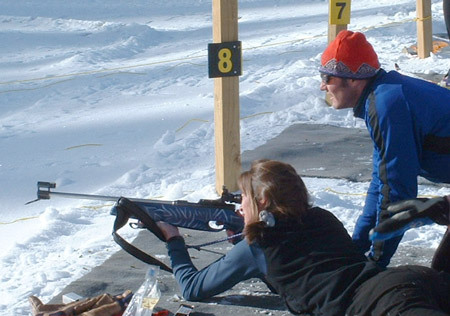 During races when the Red Book Certified under-aged person is using a .22 caliber rifle, the supervising adult or parent must remain in the coaching area. "Closely supervise" is interpreted to mean that the supervising adult must be within 20 feet of the shooting position during the shooting interval. "One-on-one" shall be interpreted to mean that the responsible adult may not supervise more than one under-aged person at the same time. The responsible adult may supervise multiple persons serially and without overlap. Cost for Certification Clinics is $20.00 plus the cost of the appropriate one-year CBC membership. (See the PDF version of the membership form for membership fees.) Club rifles and ammunition are provided for clinic participants. If you already own a suitable .22 that you'd like to use for racing, bring it (and ammunition) with you. Ammunition must be standard velocity .22 long rifle. Attendance at a Certification Clinic provides lifetime safety certification with the USBA/CBC. Subscribe to the CBC members mailing list to receive announcements about safety certifications and other CBC events. Click small images to go to larger versions.